Georg Büchner was a genius and also something of an enfant terrible. He died in 1813 at the age of 23, having written a few plays and a novella, works that more or less tore up the terrain. Like Rimbaud in French poetry, Büchner is a figure that, once he became recognized, can lay claim to having originated so much. Steeped in Shakespeare in the age of Goethe, a revolutionary, a Romantic as only the highly ironic German Romantics can be, Büchner, in Leonce and Lena, the latest show at the Yale Cabaret, lampoons aristocracy, court life, melancholy princes, the relation of master to man, and the course of true love. It’s a wild ride made wilder by Emily Baldasarra’s creepy puppets and Haydee Zelideth’s colorful costumes and greasepaint. Written in 1836, Leonce and Lena gives a comeuppance to every notion of comic drama that precedes it and to most that succeed it. Directed by Elizabeth Dinkova and Gavin Whitehead, who also translated Büchner’s heady text, full of verbal sallies and philosophical silliness, Leonce and Lena is the kind of play that cries out for staging in the Cabaret. This is a show that wants us to see the strings, so to speak, not simply because theater is illusion and all that, but because characters and actors are “puppets” even when they’re flesh and blood. Büchner is the sort of writer who keeps up his sleeve the fact that nothing’s up his sleeve. The play’s pay-off is the happily ever-after of unmasked automatons. When it comes to “holding as ‘twere the mirror up to nature,” Büchner early on sussed that “there’s no there there” and we’re all clad in borrowed robes. It’s a big cast, with some notable Cab debuts: first of all there’s dramaturg Josh Goulding as Leonce when at court in the kingdom of Popo. Goulding’s natural Brit accent lends a welcome diction to Leonce’s ennui. Addressing himself in the third person, Leonce calls upon himself to deliver—and does—a suitably self-involved soliloquy, a high-point of comic inflation. 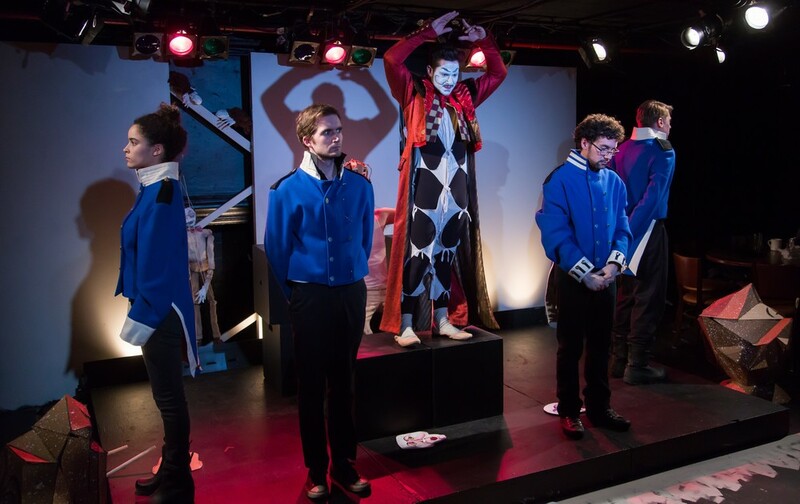 As Leonce’s man Valerio, Ricardo Dávila shines as an exacting servant, a Pierrot full of asides and commentary, trying to keep his master to some kind of recognizable code of conduct. And Anna Crivelli's Lena, princess of Pipi, kicks against the role of love interest with some imaginative flights of her own, attended by Lynda A. H. Paul as her doting governess. There are also many Cab encores: to Edmund Donovan falls the less abrasive Leonce of the Italian sojourn, which is to say the Leonce who falls in love with Lena once he hears her voice. 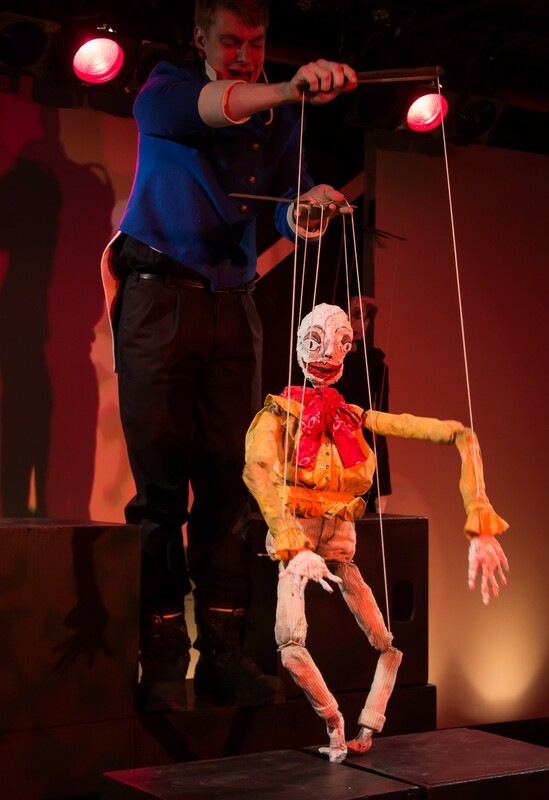 Some much appreciated comic bits are served up by cast members with a puppet on each hand—Juliana Canfield provides slow-witted servants and Nahuel Telleria, in a wonderfully energetic segment, two flatfoots trying to decide how to proceed. The stringed puppets are ably manned by Steven C. Koernig (Schoolmaster), Telleria (President and General), and David Clauson (Master of Ceremonies). Last but not least is the dull-minded babble and erratic mutterings of King Peter, another bright comic turn from Sebastian Arboleda, last seen at the Cab as one of Catwoman’s doltish, dancing henchman in Catfight. In performance, Leonce and Lena loses some of its sparkle during Leonce’s Italian adventures, which may be attributable to the fact that both Goulding and Arboleda are offstage for too long, since they early on give the play its antic tone. Clambering about on boxes to simulate a trek over rough terrain, and coming to terms with the more lyrical side of life are somewhat diverting, but not nearly as rich for satiric send-up as life at court. The “mistaken identity” ploy of many a romance is served-up here with Leonce and Lena both in flight from their arranged marriage, only to find themselves inevitably drawn to one another, if only because that’s what the plot, or the gods (and that’s the same thing in theater), demand. Büchner’s final flourish is having two automatons wed in the couple’s stead, if only so that Peter’s edict not go unfulfilled. All are pleased when the box-headed creatures turn out to be the lovers who have found themselves amenable to what they had resisted. All’s well that ends well, and our puppets please us best by seeming happy with what we make them do. Amidst the shenanigans is Büchner worrying the inevitable clash of free will with law in an absolutist state while seeking what might be called full artistic license. Whitehead’s text exults in the verbal flights and his and Dinkova’s puppet show plays up the theme of the arbitrary necessity of dramatic plots. One wonders if, had he lived, Büchner would have stuck with theater. He never managed to finish his best-known work, Woyzeck, which may be a way of saying that sending up, as with Leonce and Lena, “the well-made play” doesn’t help one construct a play according to a different aesthetic. There’s no happy ending for those born before their time.